Rubbermaid means quality. Didn’t finish your lasagna? What do you do? Put it in your trusty Rubbermaid tupperware. Forgot about that lasagna in the back of your fridge for two weeks? Who you gonna call? Not Ghostbusters! Rubbermaid has you covered with versatile garbage bins. What do you do if you need to transport lots of supplies across a factory? How do you dump dozens of garbage bins full of trash without having to take a dozen trips? These and other problems can be solved with tilt trucks. Tilt trucks? You heard right. The solution to your logistics problems comes in a tool that can allocate your many processes into a collective easier step. Say you have to throw out the garbage out of a five floor office building. Are you going to go to a cubicle, take the trash out, run to the dumpster? Then lather rinse and repeat for all the hundreds of cubicles in that building? Manage your time by cutting out the “running to the dumpster” step and throw all the hundreds of bags into a heavy duty tilt truck that has a leaver lock and a easy release. You’ll cut down a 10 hour job down to a fraction of the time. Tilt trucks are effective at transporting small loads and dumping everything out at once. 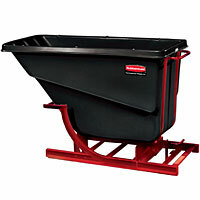 If your future includes Rubbermaid tilt trucks then you can say goodbye to your logistics headaches. The MTE-1100 Series is an inline high speed tray erecting system that automatically forms, seals with hot melt glue, and discharges trays at speeds up to 40 trays per minute. This system is ruggedly built and compact in size with simple tool-less adjustments between tray sizes. The MTE-1100 is used in a variety of industries and can be easily integrated with other packaging equipment. All machinery is designed for high durability and around-the-clock operation. These tray erectors will be “built-to-stock” and ready to ship, in most cases, within five working days of order. The Masters Series tray, case and box erectors are available in addition to ARPAC’s wrap-around tray/case packers and end-load tray packers. These tray erectors will be on display at this year’s Pack Expo show at McCormack Place in Chicago, Booth # S-400.